Our range of 'Continental' style window and doorway shutters has been designed to suit all commercial and domestic applications. They can be face fitted to an existing opening, fitted within an existing opening or fully 'built-in' at the time the opening is formed. They help to increase protection against vandalism and burglary, control inside temperatures and reduce noise from outside. These can be fitted externally or internally to most buildings with a compact roller box design to minimise the visual impact. 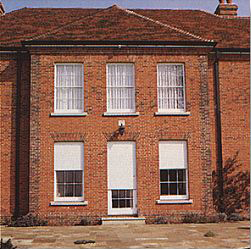 Fitted within the fabric of the building during construction or major refurbishment our built-in shutters provide unobtrusive protection, which is designed to blend seamlessly, disappearing when not in use. The compact shutter box and guide rails are hidden behind the outer course of brickwork. Both options are available in two types of slat. Lightweight and compact, the C15 has CFC-free foam filled 40mm deep aluminium laths, offering good strength, insulation and sound deadening. Suitable for lower security applications. Manufactured from strong double wall 38mm deep extruded aluminium laths, the C38 is ideal for higher security domestic and medium security office/commercial use with the option of part (when only partial vision is required) or fully punched/perforated curtain. Standard colours are: Guides, bottom rail and box housing in white or brown. Curtains in white, brown or cream. Insulated foam filled steel slats in white or brown. This type can include solid slats for blackout or punched sections, which admit a gentle pattern of light when curtain is slightly opened. (When curtain is fully closed punched sections will not let light through). Corrosion resistant twin walled aluminium slats in white or brown as standard with powder coated finish in a standard BS/RAL colour as an option. This is the strongest slat and is recommended where a higher degree of security is required, i.e. ground floor office windows. 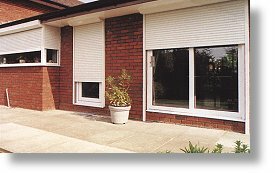 Our shutters are available with four methods of operation dependent on size. Electric by single-phase 240V motor mounted within the roller, with or without manual override. Our electrically operated shutters include a surface mounted rocker switch as standard. We can also include 'Group Control' whereby more than one shutter can be operated from one switch. The 'Auto Lock' automatically locks the curtain down without the need for keys, when fully closed and automatically unlocks the shutter when raised.